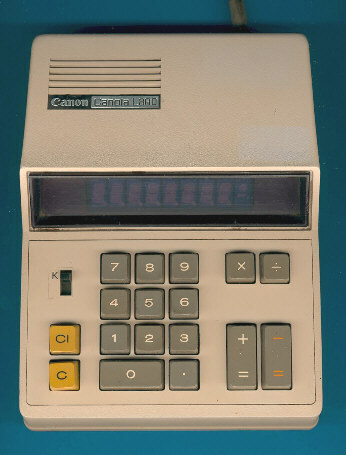 Size: 8.0" x 6.5" x 2.6"
The Canon Canola L800 was introduced short time after the first desktop calculator manufactured by Texas Instruments - the TI-3000. The L800 was the first Canon desktop calculator using the TMS0105 single-chip calculator chip. Within roughly 12 month the brain of a desktop calculator was reduced from four (L100) chips to two (L100A) chips and to a single chip (L100S). This L800 fits the whole electronics of the L100S in the smaller housing of the L100A. The display found in the L800 is similar to the Panaplex style found in the early desktop calculators manufactured by Texas Instruments. The Hitachi display module uses white ceramics instead the glass construction of the Panaplex™ manufactured by Burroughs. Don't miss the L1210 driving a 12-digit Hitachi Display module. © Joerg Woerner, February 3, 2002. No reprints without written permission.